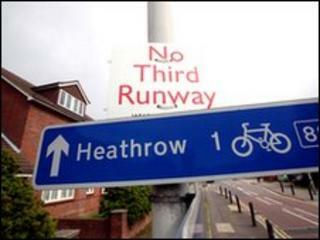 The UK's new coalition government has cancelled controversial plans to build a third runway at London Heathrow airport. It will also refuse extra runways at London's other two main airports, Gatwick and Stansted. The leaders of the new government pledged that they would work together to build a new low-carbon economy. And they have agreed a deal to allow a new generation of nuclear power stations to be built. Campaigners responded with joy to the airport news. Ben Stewart of Greenpeace said: "This is fantastic news that will be met with great relief. "A third runway at Heathrow was always a bizarre proposal that made no sense to anybody who understood the impact aviation has on our climate. "The politicians who promised they would do this have been good to their word." The policy may send birds in the Thames Estuary flapping for cover, though. If demand for flying in the South-East continues to increase, operators may look eastwards for a new airport. Today's announcement reveals that air passenger duty will be scrapped and replaced by a tax on the plane, not passenger. This is likely to mean that full flights (often budget airlines) will get cheaper and poorly-used flights more expensive. There are several ramifications to this policy, which will play out in time. The pressure on South-East airports will be eased if the new government keeps its word to build a high speed rail network. But some Tories have been worrying about the cost of this at the current time, and that will surely be a factor in the timing of any plans. On nuclear, the parties have agreed a deal which is supposed to allow the Conservative majority to push through new nuclear stations through the energy department which will be run by Chris Huhne from the Liberal Democrats who have an historic opposition to nuclear. It is likely the Tories will frame policy and the Liberal Democrats will be allowed to abstain on the nuclear vote, although they may speak against. Labour will support nuclear, though, so the stations will get built - if conditions are met. Today's agreement says there will be no public subsidy, and Liberal Democrats will be inside government offices to ensure that no hidden inducements are sneaked through. It is by no means certain that firms will want to go ahead with nuclear stations unless they are offered better incentives. The document does promise that the government will ensure a "floor price" beyond which the cost of buying carbon credits cannot fall. This will mean the price of fossil fuel continues to be elevated, so making nuclear a more attractive option as it does not require carbon permits to generate power. But a government source told me Labour had looked at the same option and had been advised that it would break EU law. The EU said they could not comment until they received a firm proposal. That leaves more than an element of doubt over nuclear new-build. The Liberal Democrats will have to tread carefully with their own supporters on this issue. The Green Party has already been angling for disaffected Liberal Democrat environmentalists for the next election. For Mr Cameron, the coalition is something of an environmental God-send. The Liberal Democrats were judged by far the greenest of the main parties by Friends of the Earth, and their presence in government gives weight to Mr Cameron's Vote Blue, Go Green slogan. The Liberal Democrat cohort also buffers the Prime Minister from his own back-benchers, many of whom are sceptical about man-made climate change. Already, the former Chancellor Nigel Lawson's climate sceptic think tank the Global Warming Policy Foundation has demanded a freeze in any UK unilateral action on emissions cuts. Mark Kenber, international policy director for The Climate Group said: "It is good news that this new coalition government will reinforce the UK's bold international leadership on climate change. "Today's commitments will accelerate a clean industrial revolution, creating green jobs and a prosperous low carbon economy for Britain." In their first press conference Mr Cameron and Mr Clegg both pledged a low-carbon economy, but there will be doubts about whether low-carbon energy targets will be met and whether Conservatives will be prepared at this time to continue to underpin low-carbon jobs. Before the election, they indicated a determination to cut funds to the North-East, for instance, a major low-carbon hub. This may be a source of future tension. On broad energy policy there is, though, wide agreement on policy. Ministers will commit to a "huge" increase in energy from waste digestion by bacteria and the roll-out of "smart" interactive local electricity grids. They will mandate a national recharging network for electric and plug-in hybrid vehicles, though it is not clear what "mandating" means and who is to be mandated. No new coal power stations will be built unless they pass a carbon emissions standard, though the standard is still to be decided. This will mean any power stations will have to have at least partial carbon capture and storage. The government will continue Labour plans for four carbon capture and storage demonstrations in which power station emissions will be pumped into underground rocks. Finally, a measure that might affect many people's lives - if it is implemented. The government will adopt measures to promote green corridors and wildlife, although there are no more details and it is hard to imagine this policy will be a priority in the short term. And what of the Liberal Democrat manifesto promise of a broader right for people to roam in the countryside in the Scandinavian fashion? There is no mention of that in the joint statement and it may be that Conservative landowners have barred the gate.